Today marks the 109th birthday of Paramahansa Yogananda, one of the great Spiritual Lights of the 20th Century. Born in India in 1893, Yogananda came to the United States in 1920 to deliver a message of universal brotherly love, spiritual advancement through Self Realization, and the fundamental unity of all religions. He was the author of many important books on spiritual insights, but he is undoubtedly best known for his seminal classic, Autobiography of a Yogi, first published in 1946. This single powerful memoir of a man's journey towards earthly unification with God has profoundly affected the lives and spiritual growth of millions of people worldwide. For the first time in English, Autobiography rendered not only Yogananda's personal story, but a first hand accounting of the great Yogi masters and Hindu saints of India written by an Indian yogi. The American public generally had a very limited and distorted view of India's yogis and swamis, often confusing them with street entertainers or fakirs, mostly due to the ignorance of movie and popular novel writers. A swami is a person who belongs to a monastic order and would be comparable to a monk or brother in western society. by a revered and saintly guru, Lahiri Mahasaya, "Little mother, thy son will be a yogi. As a spiritual engine, he will carry many souls to God's Kingdom." "Paramahansa Yogananda was born Mukunda Lal Ghosh on January 5, 1893, in Gorakhpur, India, into a devout and well-to-do Bengali family. From his earliest years, it was evident to those around him that the depth of his awareness and experience of the spiritual was far beyond the ordinary. In his youth he sought out many of India's sages and saints, hoping to find an illumined teacher to guide him in his spiritual quest. It was in 1910, at the age of 17, that he met and became a disciple of the revered Swami Sri Yukteswar Giri. In the hermitage of this great master of Yoga he spent the better part of the next ten years, receiving Sri Yukteswar's strict but loving spiritual discipline. After he graduated from Calcutta University in 1915, he took formal vows as a monk of India's venerable monastic Swami Order, at which time he received the name Yogananda (signifying bliss, ananda, through divine union, yoga). His ardent desire to consecrate his life to the love and service of God thus found fulfillment. Yogananda began his life's work with the founding, in 1917, of a "how-to-live" school for boys, where modern educational methods were combined with yoga training and instruction in spiritual ideals. Visiting the school a few years later, Mahatma Gandhi wrote: "This institution has deeply impressed my mind." In 1920, Yogananda was invited to serve as India's delegate to an international congress of religious leaders convening in Boston. His address to the congress, on "The Science of Religion," was enthusiastically received. That same year he founded Self-Realization Fellowship to disseminate worldwide his teachings on India's ancient science and philosophy of Yoga and its time-honored tradition of meditation. For the next several years, he lectured and taught on the East coast and in 1924 embarked on a cross-continental speaking tour. The following year, he established in Los Angeles an international headquarters for Self-Realization Fellowship, which became the spiritual and administrative heart of his growing work. Over the next decade, Yogananda traveled and lectured widely, speaking to capacity audiences in many of the largest auditoriums in the country -- from New York's Carnegie Hall to the Los Angeles Philharmonic. The Los Angeles Times reported: "The Philharmonic Auditorium presents the extraordinary spectacle of thousands....being turned away an hour before the advertised opening of a lecture with the 3000-seat hall filled to its utmost capacity." 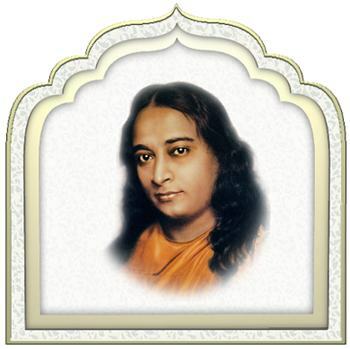 Yogananda emphasized the underlying unity of the world's great religions, and taught universally applicable methods for attaining direct personal experience of God. To serious students of his teachings he introduced the soul-awakening techniques of Kriya Yoga, a sacred spiritual science originating millenniums ago in India, which had been lost in the Dark Ages and revived in modern times by his lineage of enlightened masters. In 1935, Yogananda began an 18-month tour of Europe and India. During his yearlong sojourn in his native land, he spoke in cities throughout the subcontinent and enjoyed meetings with Mahatma Gandhi (who requested initiation in Kriya Yoga), Nobel-prize-winning physicist Sir C. V. Raman, and some of India's renowned spiritual figures, including Sri Ramana Maharshi and Anandamoyi Ma. It was during this year also that his guru, Swami Sri Yukteswar, bestowed on him India's highest spiritual title, paramahansa. Literally supreme swan (a symbol of spiritual discrimination), the title signifies one who manifests the supreme state of unbroken communion with God. During the 1930s, Paramahansa Yogananda began to withdraw somewhat from his nationwide public lecturing so as to devote himself to the writings that would carry his message to future generations, and to building an enduring foundation for the spiritual and humanitarian work of Self-Realization Fellowship (known in India as Yogoda Satsanga Society). Under his direction, the personal guidance and instruction that he had given to students of his classes was arranged into a comprehensive series of Self-Realization Fellowship Lessons for home study. On March 7, 1952, Paramahansa Yogananda entered mahasamadhi, a God-illumined master's conscious exit from the body at the time of physical death. His passing was marked by an extraordinary phenomenon. A notarized statement signed by the Director of Forest Lawn Memorial-Park testified: "No physical disintegration was visible in his body even twenty days after death....This state of perfect preservation of a body is, so far as we know from mortuary annals, an unparalleled one....Yogananda's body was apparently in a phenomenal state of immutability." On the occasion of the twenty-fifth anniversary of Paramahansa Yogananda's passing, his far-reaching contributions to the spiritual upliftment of humanity were given formal recognition by the Government of India. A special commemorative stamp was issued in his honor, together with a tribute that read, in part:"
"The ideal of love for God and service to humanity found full expression in the life of Paramahansa Yogananda....Though the major part of his life was spent outside India, still he takes his place among our great saints. His work continues to grow and shine ever more brightly, drawing people everywhere on the path of the pilgrimage of the Spirit." We attended a wonderful and moving devotional at the Fullerton, California SRF Temple at 7PM on January 5. The ambiance of love, devotion, reverence and peace from all who were there was simply unforgettable. Everyone shared in a bit of birthday cake and pleasant conversation afterwards. What a magnificient evening spent in the spiritual presence of this great avatar. I strongly urge you to read his books. They will bring you closer to God and provide a lifetime of spiritual nourishment.